appointments doesn't leave much online time but i'm here today. some Charity Cards which I may bling up a little. I'm feeling a bit deflated about it to be honest but I guess i'm only human. on it's way to Canada i'm confident they will all arrive in good time for Christmas. in between writing the rest of those Christmas Cards. Take care everyone & Thanks for hosting Julia. You are certainly busy creating such lovely Christmas cards! It's a great feeling to have the overseas cards in the mail! I have achieved the same! Thank you for visiting my blog and leaving such a lovely comment on my angels! They are such a joy to create! Good news about the op, let's hope it goes ahead then in time for Christmas. Don't even worry about not doing all handmade cards, you've had way more important things to cope with...and no one will care if you send them a shop bought card this year. So pleased that hubby has a new date, hopefully it will go ahead and he may feel a lot better by Christmas, I will keep everything crossed for you. Morning Tracey. Yes, I do trust your hubby's op goes ahead on 10th - postponed ops are horrid - you get all geared up... then feel so deflated. 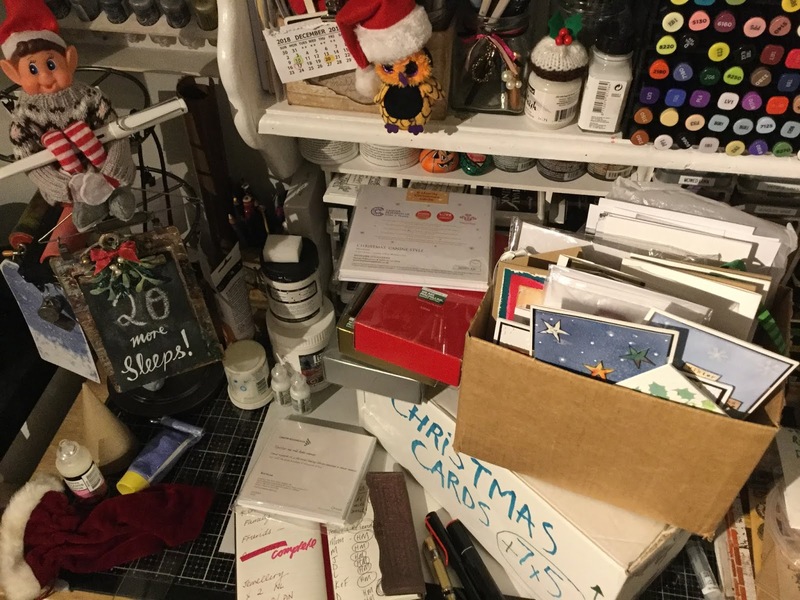 Well done on finding all those Christmas cards - no need to be stressed out - if we can't make them all, well... we just can't. There's only 24 hours in each day. You are so perfect organized! Well done! You have a lot on your plate and you are still going strong...good for you!!! I am sorry your hubby had his surgery delayed. It is always so hard to wait for a new date. Praying that all goes well. Oh Tracey, here am I moaning that I have no time because I am having a new bedroom done and you are there awaiting DH going in hospital for an operation. Makes me realise how my troubles are nothing and I should be joyous. Hope that everything goes alright with the operation on Monday, will be thinking of you both. Love your elf on the shelf and the owl too. Glad you found some cards you can use (I did too remember). Hi Tracey, Will keep everything crossed your hubbys op goes ahead on the 10th. Last posting day for Canada is 13th December, so it should arrive ok. Thank you for dropping by my blog.. I know how worried you are about your husband. Keeping my fingers crossed his surgery happens this time. Hello to you Tracey~ I am not familiar with the WOYWW, but the truth is, I'd be embarrassed to show! My desk is hollering "help!" lol. Looks like you have a busy, happy desk! And some cards tucked away that will come in very handy~ I'm glad that thru all your difficulties (Dr's, appt's, and the op . . . life!) you still have some time to visit Blogland and keep in touch. Thanks for the visit my way~ I appreciate you! You can only do what you can and time zips by so quickly and especially this time of year x. Thinking of you x. Do hope all goes well with the op on Monday - and you mustn't beat yourself up about the Christmas card situation... we're all only human, and you have to take care of yourself too! Today is the 10th and I am sending you huge hugs and every best wish in the world for a successful surgery and recovery for your husband,as well and calmness and peace for you ,my friend!